I've been laid up some this week again with a back spasm and haven't done the sewing I'd like to have. Hubby picked me up an electric heating belt that velcros around the waist. It has been my saviour-- gotten me off the sofa! I worked some this morning on my birches and then after lunch I did a bit of free motion stitching on one of the poinsettia prints. I don't want to lose the print affect so won't do much more. Just a bit in the leaves. Ill add a wee bit of greens to the leaves and call it done. Then, I need to decide if it'll be a runner or a topper for centre table. I have another one so maybe both. Next step is to chose some fabrics to finish it off and then sandwich it for quilting. I've got to run. I'm heading downtown on an errand and then tutoring for an hour at the library. I finished the little snap bag that I started the other day. It makes me want to giggle when it snaps closed. 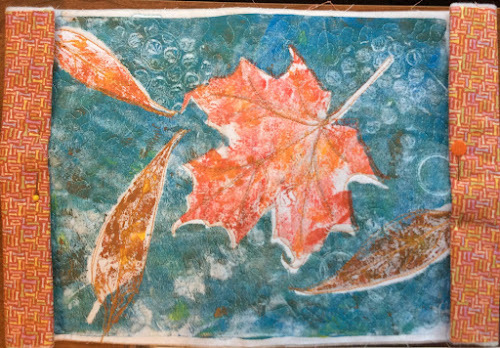 I think it makes good use of my gelli print. Here's the other side. 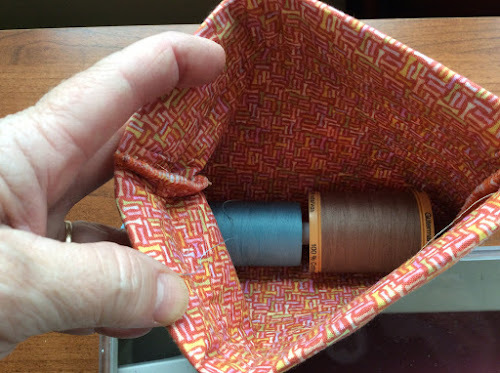 Although it wasn't mentioned in the pattern, I thought the prairie points might be used to tug it open; however, they do seem to stretch a bit. It's easy enough to open with the fingers and they're cute anyway. Next time though maybe I'd try little loops. I didn't put a handle either and I could. Also, I found that once I stitched it closed and turned it that the ends of the aluminum tape are still quite long and seem to be stretching the pocket. I believe I'll open one side and cut a little more off. 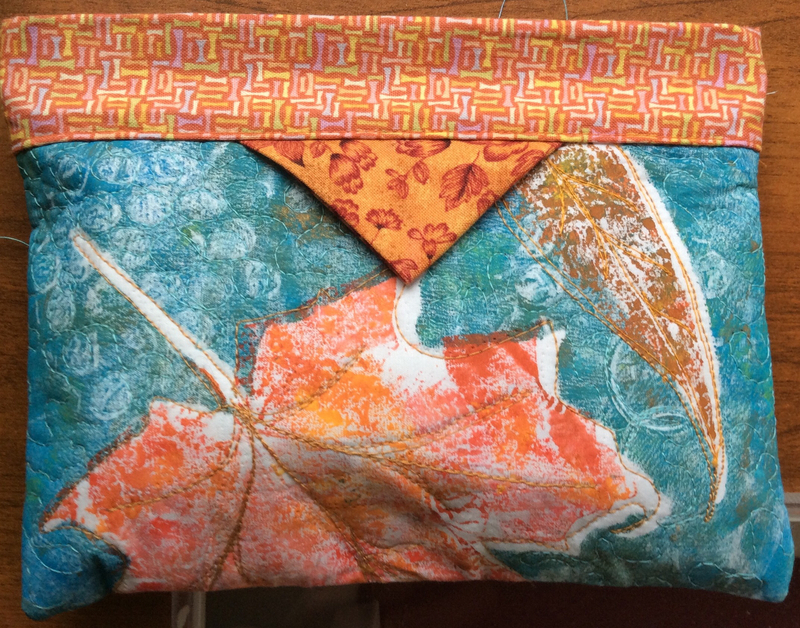 It was a fun little bag to make and I'll probably try a few more in different sizes here and there. That's it for my Sunday. A leisurely breakfast with hubby, the crossword, baking muffins, and visiting hubby's parents filled the rest of my day. I hope you're having a pleasant Sunday too! I didn't really mind the wet day as it meant I could ignore what needs to be done in the garden and head to the sewing room. I'm still working on adding leaves and foliage to my birch tree fiber art piece. Today, I made some confetti leaves in a slightly different manner than my usual method with the Saran Wrap and I think it may be faster and easier. I sandwiched the bits of fabric leaves in between a layer of Sulky dissolvable and beige tulle. I hooped the first batch, but I was in such a hurry for the second batch that I didn't bother with the hoop. It looks like this after free motion stitching the layers, netting side up, although I stitched it with the netting side down. Here it is above with the Sulky rinsed out. It looks like this once dry. Perfect to add to a scene wth trees. Something that I just discovered are the 'snap bags'. There are lots of styles and tutorials on Pinterest. The closure is made with two sections of an aluminum measuring tape slipped inside the top edge. I thought it would be a fun way to use some of my prints. 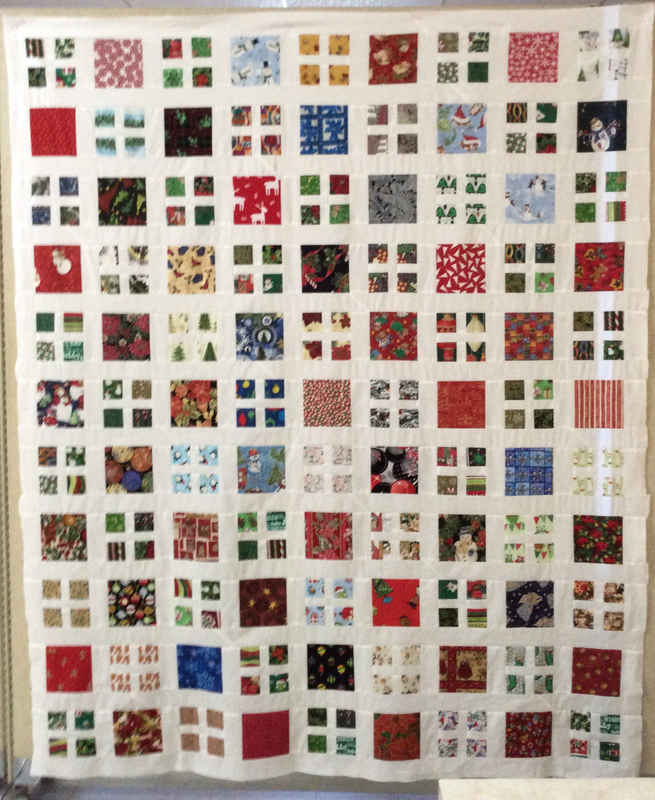 It's all quilted but it needs the prairie point handles before I stitch up the pockets for the tape. While I'd like to finish it, supper needs finishing. Stew with dumplings. I hope to finish it over the weekend and post the finished bag. It just amazes me the ideas that people come up with! I spent a very relaxing weekend at our local guild retreat-- two nights, Friday and Saturday. I arrived Friday morning and left Sunday around 2:00. Meals are home cooked and we all have our own little room. Amid a steady hum of machines there is always chatter and sporadic laughs and sometimes raucous laughter and craziness! 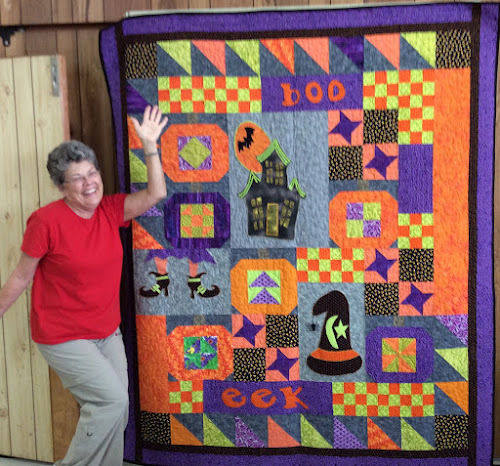 By Saturday supper I had finished putting together the top of my Halloween quilt. I was so intent that I missed getting a picture of my friend, Glenda's. Hers had black sashing which I loved. This Christmas one by Gail caught my eye with all the different Christmas prints that I believe she received in a mail exchange. Isn't it pretty? 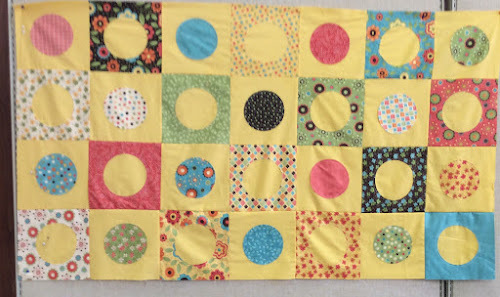 Another pretty one was this sunny yellow one by my freind, Donna. I missed getting a final photo. I think she got it finished. Then, there was this colourful Halloween block of the month quilt, by Anne; already finished but the binding was added. There were many more beautiful projects that I missed photographing, I was enjoying myself so much! Last night, for the first time in months, I slept through until this morning. I enjoyed my porridge along with a sketch. 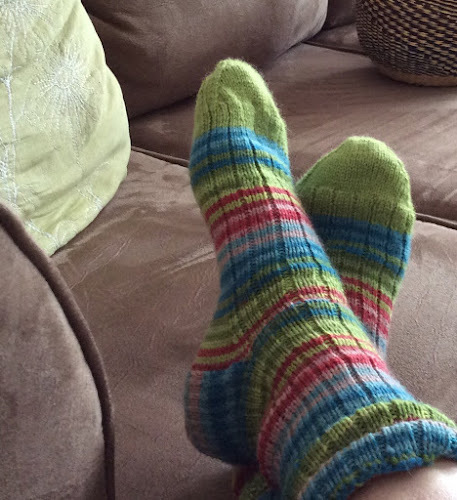 It snowed a bit yesterday, and was cold today, so I donned a new pair of socks, gifted to me from my friend Sue for my birthday. They are so soft and warm and the colours make me smile. This afternoon, I took advantage of having a second vehicle and went to a drop in sock knitting at the local yarn shop, The Spinning Wheel. Just like with quilters, the chat and sock knitting enthusiasm was so contagious. I will try to go regularly, I think. It's good for the soul. I realize that 1/2 of the world is now heading into spring while we are moving through fall towards winter, but it's hard not to celebrate autumn when the colors and the air are just so splendid. It kind of makes us forget for a bit that we are slowly moving toward shorter cooler days. This was another view from our outing on Monday. See what I mean? 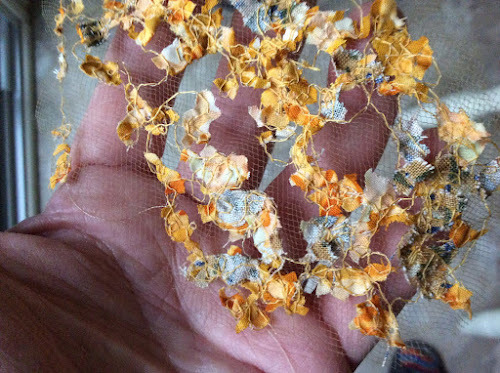 It would make a very pretty piece of fiber art. If only I could work faster, sigh. While I sketched, hubby took the camera. He sees differently than I do. I walked right by and didn't even notice this beaver felled tree. But I would notice this. I'm seduced by color. I had an occupational therapy appointment this morning and before that, I got in a few slow laps at the spa pool. After lunch, my bit of exercise done for the day, I sat down for nearly 1 and 1/2 hours to stitch a bit more foreground brush on the foreground of the birches. It adds a little color to the mostly grey, white and black piece.Sorry, I can only show sneak peaks at this point. 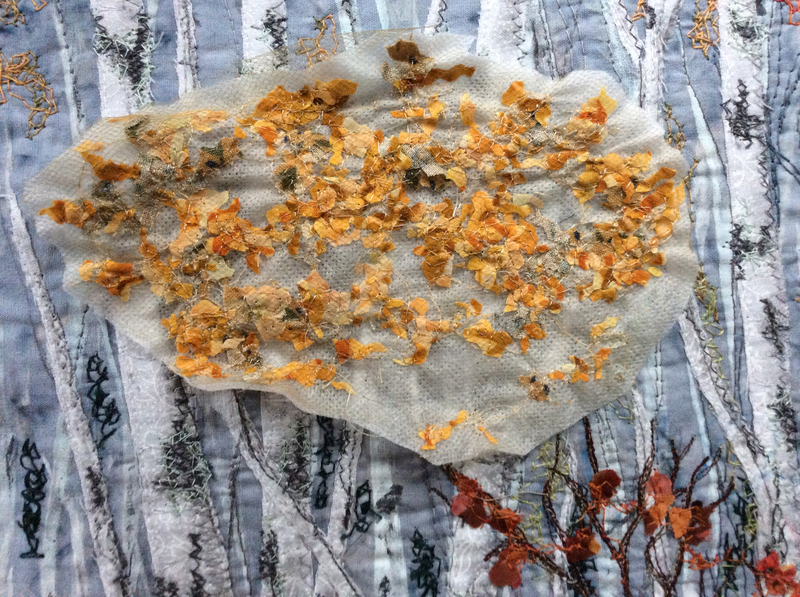 The other day I had applied the fir trees that I cut from the thread lace made on stretched netting. 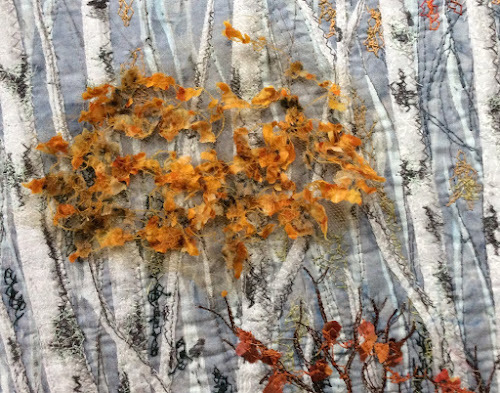 My next goal is to stitch the confetti leaves down--they're only scattered loosely about right now-- and then add the final bits of grasses and foliage to the very foreground. I do love that part! First, though I am packing for a guild retreat this weekend which was a last minute decision. 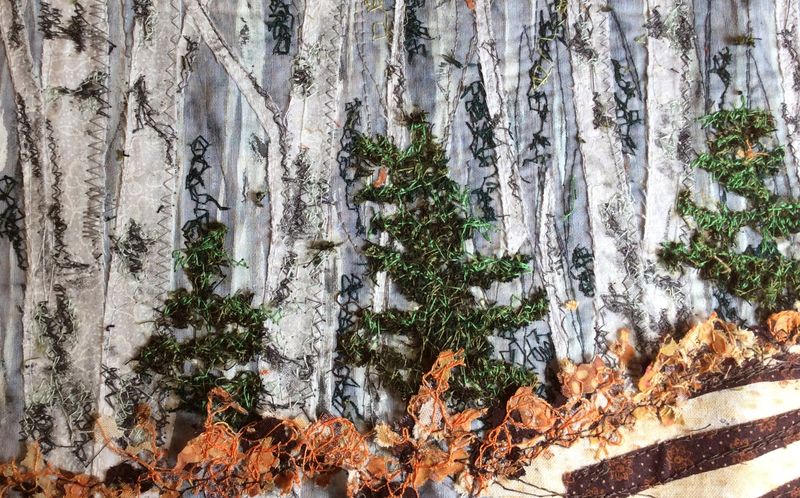 The workshop that I'd registered for at Fiber Fest in Amherst was canceled. I'm very disappointed; some year I'll get there. Lucky for me space was still available at the center so I'm going. Friday morning until Sunday. 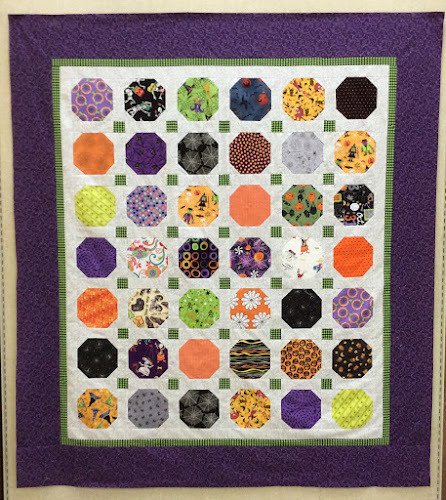 My paln is to finish the top of my Halloween quilt and to get a baby quilt top done. Maybe. I'll post pictures. Here in Canada it is fall and it is our Thanksgiving weekend. Hubby and I have spent a quiet weekend and I think it's been relaxing for Gord who still works and can use the break. For our Thanksgiving dinner, we had a roasted chicken and I kept dessert simple-- baked half pears with a few blueberries and a drizzle of maple syrup. 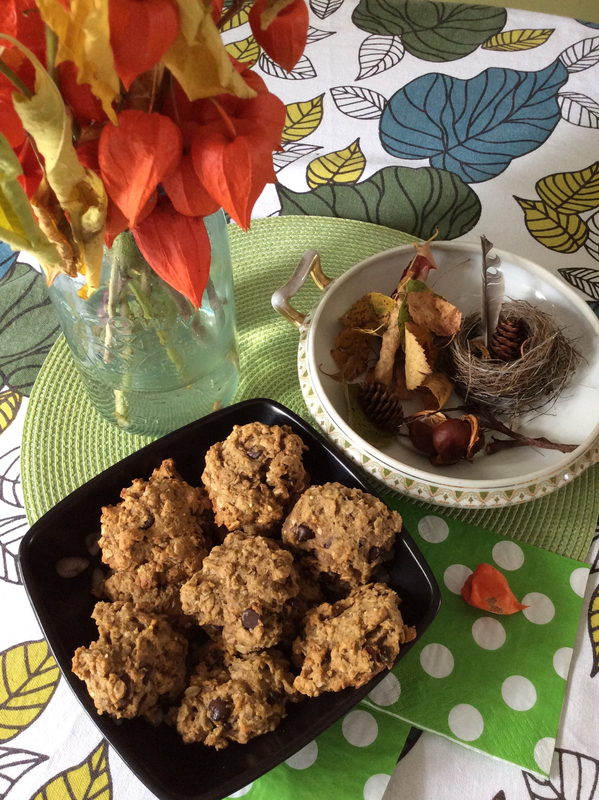 I made these pumpkin oatmeal cookies earlier in the day. The temperature rose considerably today and we decided after lunch to make the short drive to a part of the trail in east that I don't often get to. It took me 10 minutes to get to a spot I remembered. I wanted to see if I could make it on my own with poles and I can. I carried a small sling pack with sketchbook and pencils along with the new I Pad to try its camera. It took some beautiful shots. 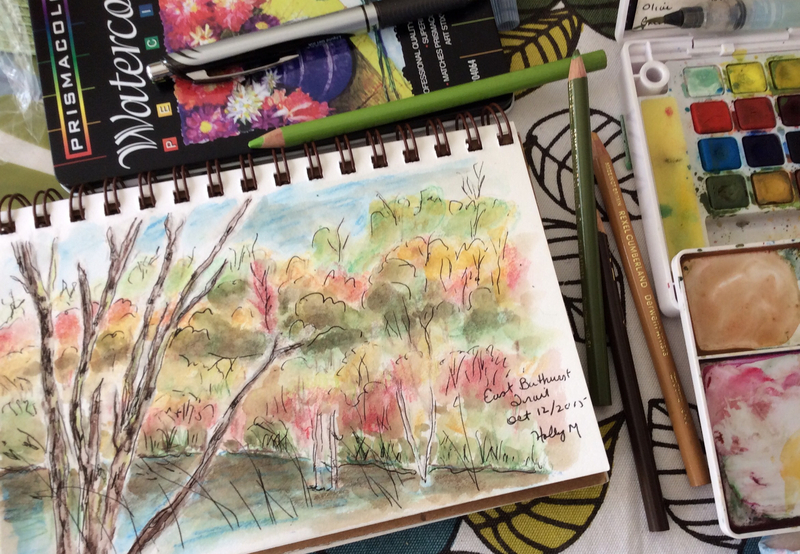 I sat for a bit and sketched while hubby strolled and took pictures with the camera. I'm curious to see how they'll compare to the I pad. I've been stitching here and there. 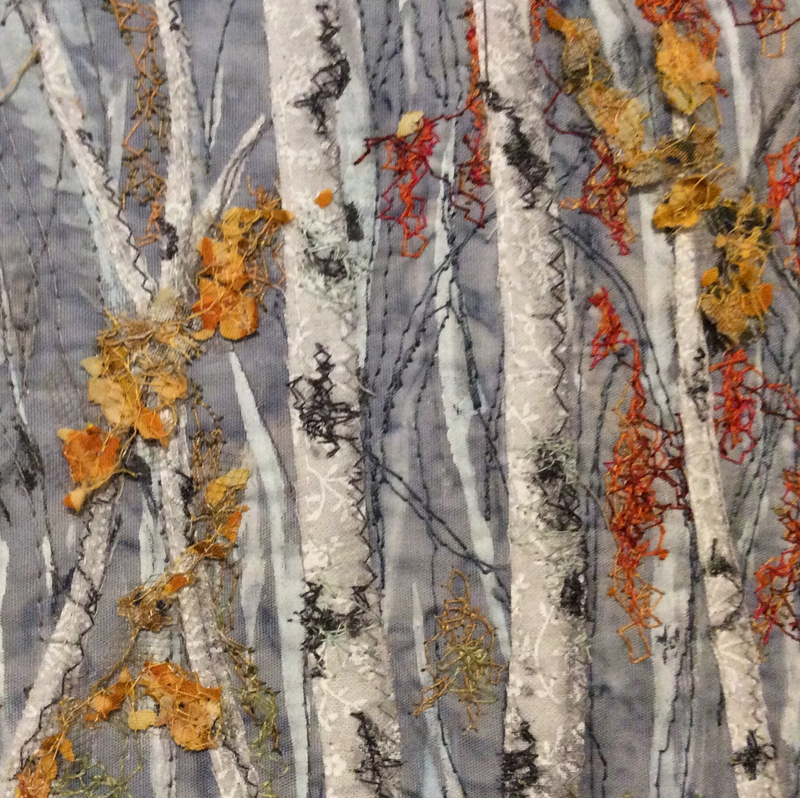 I finished some thread lace to make fir trees and I've got some stitched down to the birch piece. 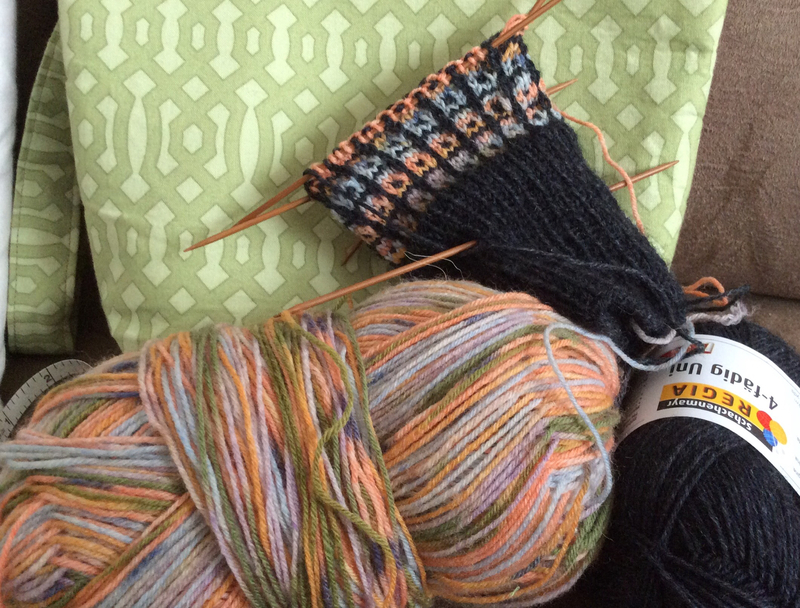 I've also started a new pair of socks. The pattern is called Ugly Duckling and can be found on Ravelry. Quite a different design but very easy to do. The sun came out a short while ago and it's even nicer out. Gord has gone to play a few holes. I think I'll go make a cup of tea and take it to the deck. The deck days may be running out. The first creative thing I did this morning was to start a sketch with my breakfast. Chinese lanterns gathered for my little birthday get together. I started to add color with the pencils but then needed to get on with my day. Yes, it is my birth month, but is that why I love it so? Not everyone born in winter loves winter. October is perfect. By the end of September, I have finally let go of mourning the loss of summer. The air is cool and crisp--still requiring only a sweater on nice days though. And I can still enjoy a cup of tea on my deck. The show of colors is spectacular! Getting brighter every day. Walking or cycling the trail is a fantastic experience when the sun is shining . You may notice that I'm still caught up by birch tees. 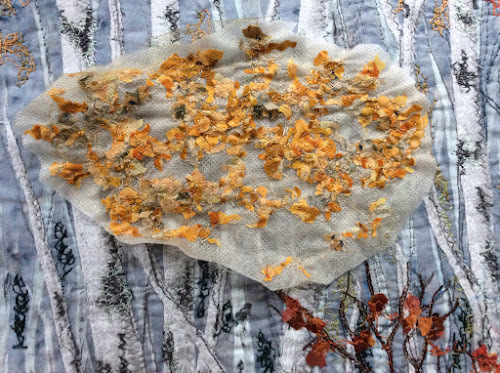 I'm going to send a few photos to be printed as I'm not done with them in my fiber art yet. I have been thinking of new ways to depict them though and I'm anxious to finish my latest work so I can test out some ideas. Mother earth has her own way of decorating the fir trees. 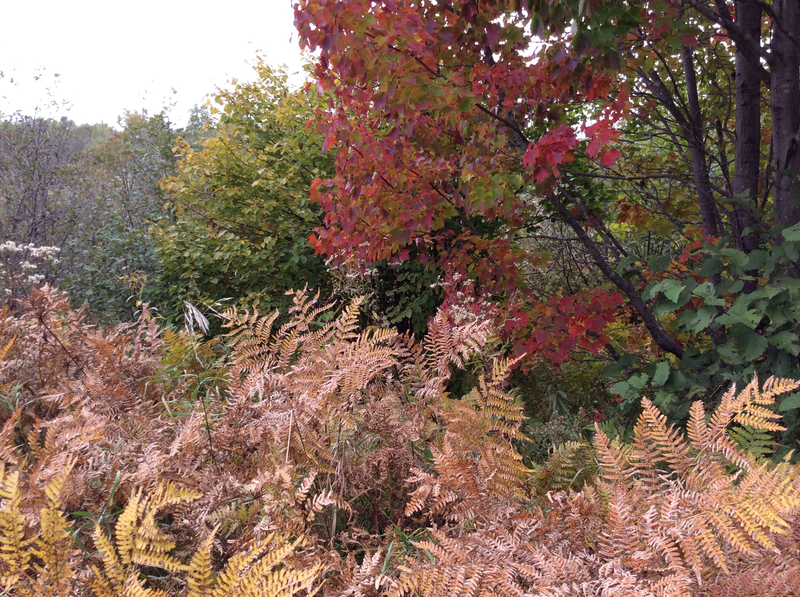 I walk the same trail every week and there never fails to be something new to see when one is really looking. I love getting as close to the ground as I can (while I can still get up, lol). Dead trees and stumps are fascinating microcosms of new growth. 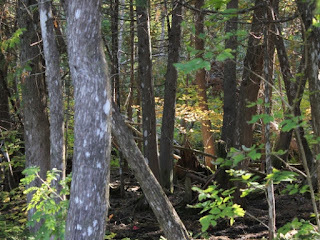 I love this world and the feelings of 'interconnectedness' I get when I'm out on the trail. I just read something that struck a note with me in an article in Fiber Art Now magazine by Suzanne Smith Arney about the artist Joyce UttingSchutter. She talks about things in nature as having a simple rhythm of complements. "Everything in nature, in the universe, is part of the rhythm, just as every breath is life giving." I couldn't describe it better. Well, now that I've philosophized, I'll move on to some creative endeavors. 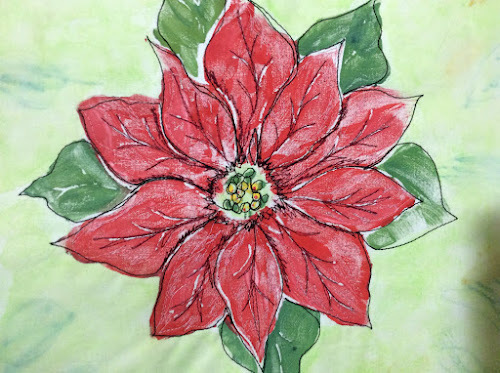 One of the projects that I've been thinking about is how to create poinsettias with paint on fabric. I could simply paint them to be sure, but I was looking for a way to produce a slightly more graphic look and to do something that might work for a workshop. 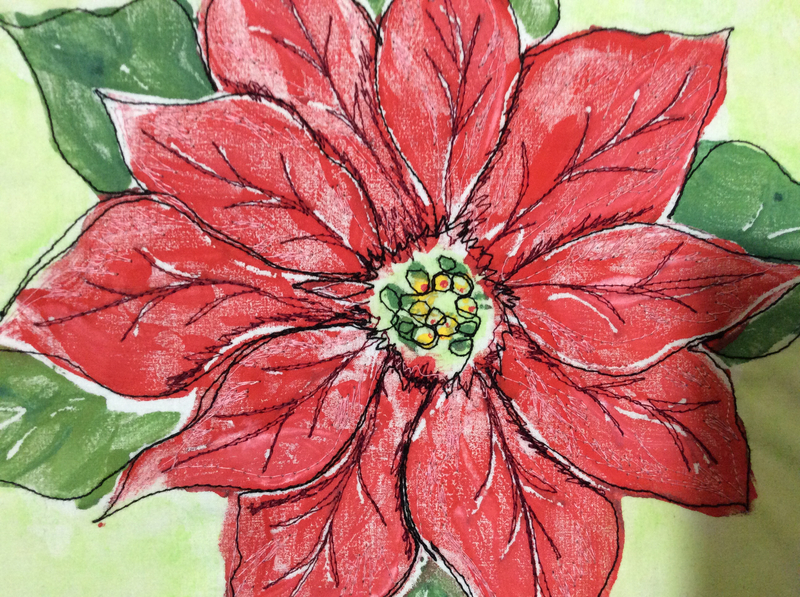 I drew up a poinsettia flower from copy-free photos and traced it onto craft foam pressing in some details with a ball point pen. Now I can use this to print as many as I'd like and in variations.I tested it out. My plan is to add a wash of color to the background in a lime green or turquoise and then do a small bit of thread painting. I'd like to make a runner. I'll leave you now with these thoughts and images. Time to attend to dinner. Oh my, I know it's been a while and I've been thinking of my readers. I've had the busiest week with a few commitments. Also, the recent weather has been so lovely that one really must take advantage before it gets too cool. For example, this past Saturday, was my first guild UFO day of the year which I didn't want to miss. 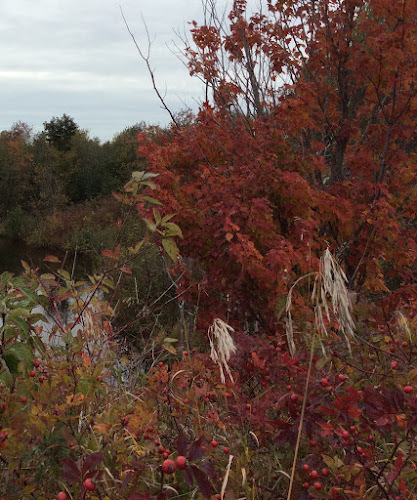 It was so nice out though that I came home by 3PM, so I could get out onto the nearby trail for some sketching. 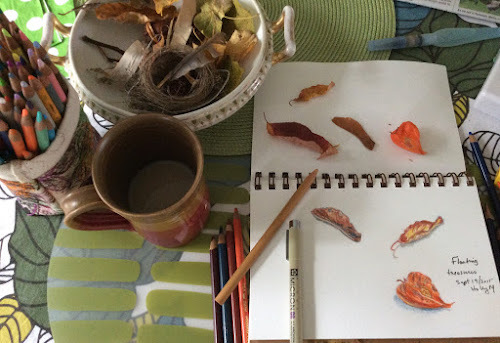 I packed up a small sketching bag, my camera and a little stool. It's about 5 minutes by bicycle from my house, so just doable for me right now. The woods are so pretty too with the changing leaf colors and the lower autumn sunlight. I want to look for a chair that's more comfortable for longer sketching times but this is perfect for now. The air was becoming chilled after I sat for a while. I'm really enjoying getting out and practicing my sketching skills. Soon it will be too cold. I hope I'll get in a few more sessions before it's too cold. There is so much to draw the eye. I've got to get this at another time of day. 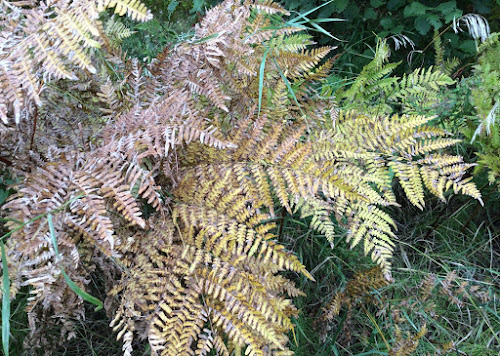 The ferns in the forefront are very golden but were unfortunately the camera was shaded. 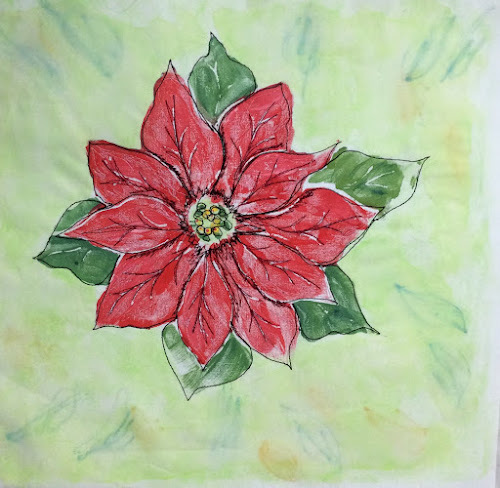 Last week, I was playing with acrylic paints on a heavy watercolor paper and my personally designed screens for a project I had in mind. This is really fun-- to gather some supplies and start applying paint without any real firm ideas of how it will end. Play time. Here is the first layer randomly scattered. Then I added a wash of watercolor in blue and green. After it was dry I cut it all up to make 2 dozen book marks. These were my party favors! Even though entertaining is totally outside our comfort zone, my husband and I held an open house yesterday in celebration of my 60th birthday. It's actually tomorrow. Several friends contributed with food which really helped. I made mini cupcakes and muffins as well as my own ice tea which was very popular! Gord ordered fruit and veggie trays. We managed at least 20 or so here and there despite our tiny house. Luckily, it was a beautiful day allowing for a bit of spillover to the deck. The only pictures we took were of me and another quilter receiving our 60th birthday quilts form our little quilting group. I was very touched to see them all trooping up the driveway. There are no words to express how it felt to see them all and to receive the beautiful quilt. I have to admit that I wasn't really looking froward to my 60th; I think because of all the physical health issues I've been having--kind of dreading it maybe. Then, when I attended another open house I got the idea that we could do it too and it would make it more of a celebration. I used the opportunity to take donations for my latest charity, The Alzheimer's Society in honor of my mom. I raised $200.! I cropped out all the other friends as I haven't' received the OK from all of them to publish them on my blog. This is my friend Anne. 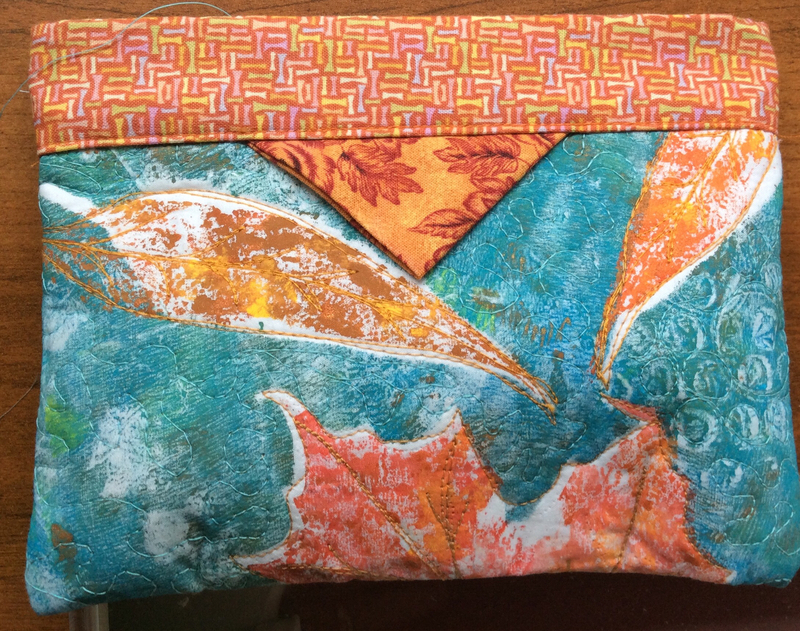 I have always loved the Bento box pattern and especially in bright colors. I had a pretty peaceful sleep under it last night. I recommend celebrating simply with friends when you're having a challenging year. Even my daughter surprised me with a quick visit from Prince Edward Island! It was a happy day. Well, I'm off now to squeeze a little more out of this beautiful fall day.